Life’s complicated. Get more time to do what you love when you become a member of Fox Cleaners. Our goal is to help you and your family live simpler, happier and cleaner lives throughout Downtown, Midtown, or South Tulsa, Jenks, Broken Arrow and Bixby. Select the option below that best fits your needs and lifestyle. Either sign up and use our online portal, or for the most capabilities, download our app. 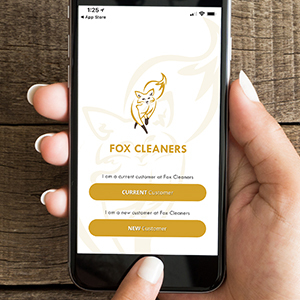 Once you’ve installed the Fox Cleaners mobile app on your device, click whether you are a current or new customer and follow the instructions on the screen. Fox cleaners, a dry cleaning store, is located in Tulsa, Owasso, and Jenks and also serves Bixby and Broken Arrow.